Namaste. My first evening in Delhi has been quiet, mainly because I seem to be the only person in the hotel awake all night. The dreaded jet lag. I cannot tolerate sleeping pills; I am wired backwards so drugs tend to have the opposite effect. The one time I took an Ambien, years ago, I bolted through the streets of London in a crazed mania for two and a half days. I spend peaceful hours reading Wm. Dalrymple's fascinating, charming and idiosyncratic history of Delhi, City of Djinns, published in 1993. Dalrymple points out that ancient Delhi has a new population since 1947, when partition forced a massive migration of Hindu and Muslims. And things have changed radically again, in the last two decades. But Delhi is a palimpsest of civilizations laid down over the centuries; our globalized,neo-tech era is only the latest. For centuries, the city has moved forward looking longingly backwards. Dalrymple describes a visit with the author of Twilight in Delhi, Ahmed Ali, in Karachi, where he lives in self-imposed exile. He is embittered, and cannot bear what has become of his beloved city. (As with all excellent books, Djinns has got me making lists of more books to read.) Ahmed Ali and an old friend of his talk about the transformations they have witnessed. "The old men swam together through great oceans of nostalgia before finally coming ashore on a strand of melancholy." 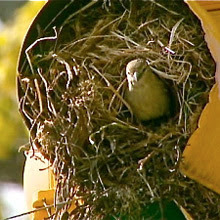 The garden and my nest?" The sun comes up in a moist, milky smog, against which the color of saris and flowers is vivid. Delhi is among the most polluted cities in the world. The smell and taste of soot from cars and trucks overwhelmed me as I left the airport, bringing back an acrid memory of the air in New York City in the sixties and seventies. I actually found myself thinking, thank goodness for the Clean Air Act. But there you have it. In the heated rhetoric against government regulations, Americans forget how fortunate we are to have protection against such massive pollution. My eyes do not stop burning. I order a large pot of the masala chai to which I quickly become addicted, and with its spicy aroma wreathed about my head, read a front page story in The Times of India: "It's only going to get hotter, wetter: Scientists' Grim Forecast Means Crop Failures." Temperatures in india are "set to get higher--way higher than what the country has recorded in the past 130 days." In the same paper is a long article from Mumbai about the alarming incidence of gall bladder cancer among people living near the Ganga and its tributaries; the water and soil of sixty villages has been found to contain a high concentration of heavy metals. Later in the morning my sister (who can take sleeping pills) and I set out with a lovely young woman, Himali (her name means Princess of the Mountain) to visit some small, neighborhood temples. Small children wander out into busy traffic to beg. Stray dogs trot along the road. Himali graduated from Middlebury College in Vermont a few years ago, and worked in New York as a freelance writer before moving back home to Delhi; she now writes about art and culture for various local publications. 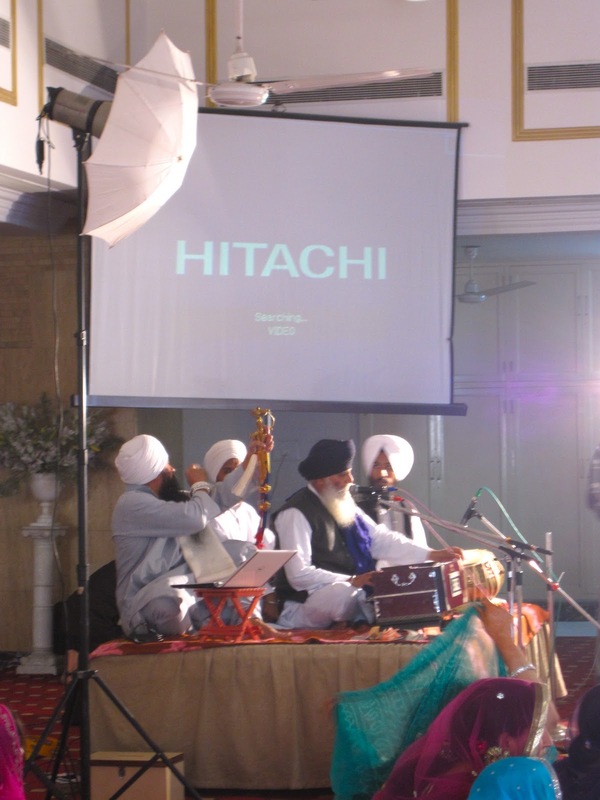 We enter a Sikh temple, but there is no retreat from technology. Even here, the computer flashes words and notes. As we sit down, Himali tells us we have wandered into a wedding ceremony. "It is an arranged wedding, I can tell. The bride and groom have barely looked at one another." I ask if this is unusual. "Not at all--many of my friends, if they have not found a suitable man by the time they are 28, they will ask their parents to arrange something for them. But we have the right to refuse." The temple fills with guests in brightly colored, sparkling saris. 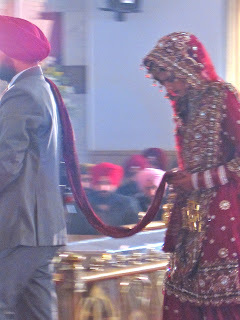 The groom lifts the sword of the Sikhs, a long scarf is draped around his neck and the neck of his bride; they walk around the central dias, he leads, she follows, head down. I begin to think of our Match.com culture as a simple technological twist on arranged marriages (with right of refusal). The morning's paper, hindustantimes, leads with the headline: "Soon, Helmets Must for Women Bikers, Pillion Riders". This regulation has been made over protests by the Sikh community, as men are not allowed to wear anything over their turbans, and women must keep their heads covered at all times. Then we drive over to the Hindu temple that Himali and her mother, Anita, visit every Saturday, as a way of spending quiet time together. We stop at shrines to various gods, ringing a bell over each one to move the spirit energy. The smoke of incense pours out of tiny pots; oil drips over statues; red string for blessings is wound around the sacred "peeple" tree trunk (the tree under which the Buddha found enlightenment)--red string tied around our wrists, right arm if not married; our foreheads are daubed with oil and crimson dye; we are given necklaces of marigolds to wear and cubes of sugar to eat, to bring sweetness to our lives. We ring the bells, summon the spirits, disperse the energy, bow low to show respect and humility. Silvers sparkle and gleam, colors glow as if lit from within, my sleepless state amplifies it all so that the vivid hues swim and shimmer and I am glad for the hallucinatory aspect of my first impressions--the sweet, the acrid, the bold, the lost, the filth, the poverty, the beauty. I want six arms, I want a tiger by my side...the poor tigers, they too are endangered; the morning's paper brought news of one killed, in error. Blessings upon us. A propitious start. And we are on our way. I have visited India and loved, loved the people, the aromas, the sights and sound and most of all the colors. Enjoy your trip and I will as well as I follow you. Is this your first visit? Can't believe it is happening already! Ah, the smell and smog...Saigon the same same as we say here. India is the most colourful rainbow in the world! Hope your travels are wonderful. I shall post the love of India in hopes that it brings a good nights rest to you and your travelers for a wonderful journey. Gifted the Dalrymple book to our friends who are leaving for India this week - coincidentally their last name is the same as author's! Can't wait for more posts capturing India for your readers! A longtime, more-than-usually-ironic (even among my pals) friend of mine, who had been eagerly anticipating her first trip to India, wrote to me that, upon arriving in New Delhi a couple of years ago(giddily stepping off the plane to embrace the sights, sounds, and smells of "The Real India") she immediately experienced an intense, momentarily disorienting deja-vu and then thought "Oh....it's La Guardia in the seventies......"
Fortunately, she was sufficiently versed in Levi-Strauss to have previously recognized the futility of expecting some very immediate "Authentic" experience. Those came later in that trip. Ironically enough, she's been back twice in the past year (specifically, to Mumbai)..... to supervise the training-procedures for the hundreds of young folks who will be doing the jobs that used to be in Rochester, NY). She claims that reading the first volume of "The Raj Quartet" on the flight-over turned out to be of very little practical use in 2008. She's also among the three experienced friends who've told me that, actually, I DON'T want to visit India. They tell me I would have an aneurism within 24 hours and would do myself a favor by staying at home, reading more Forster or Paul Scott, and re-arranging my spice-jar drawer for the hundredth time this year. The smells, the sights, the energy... 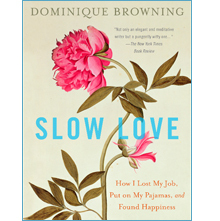 I am thinking that traveling in the Slow Love way may lead to a wonderful travel book / novel in the future...? 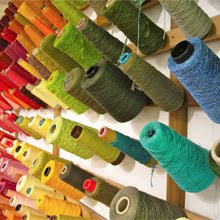 I would love to visit India, the colors, the fabrics, the food, the architecture & culture! You depict it perfectly Dominique! Beautiful photos! I hope you go to Benares and travel on the Ganges there. See the laughing Yogis at dawn and the torch-brandishing holy men at night--best seen from the water. It's completely a life-changing experience. Stay in the Hotel Ganges View. (No booze or meat available in most of this Holy City.) Your post made me so eager to go back. Soak it in, drink it up and find bliss. City of Djinns is my favorite of his books. My husband who is from Delhi gave it to me a few years ago. Explaining the history of this ancient city is no easy feat and I love how he intertwines the ancient past with contemporary India. You picked a wonderful time of year to travel to India. We were last there in April during a heat wave. New York always seems empty after returning from India's cities. Look forward to reading more about your travels. Ahhh you keep us on our toes. Where will you be tomorrow?! Of course you miss the opportunity to photograph the snow in Central Park but who cares. You have the rare ability to see near and far, details and perspective. Keep using them beeg wurds like 'palimpsest' so ah kin betr muhself! Bet them editors at yur mag wudda jus died if you hed tryed thar!